Fabrication and installation of sculptures at the Sonnabend Art Gallery in Manhattan. Zaha Hadid is known as an innovative architect who constantly tests the boundaries of architecture, urbanism and design. In the Sonnabend exhibition, “the spatial representations of her pieces redefine the notion of physical space by warping, pulling and pushing the boundaries of the galleries until the viewer is left with architectonic interpretations that create new and unfamiliar interior landscapes,” in the words of the exhibition’s organizer, Kenny Schachter. No matter how you describe it, the show breaks new ground, foreshadowing a hybrid: architectural art. 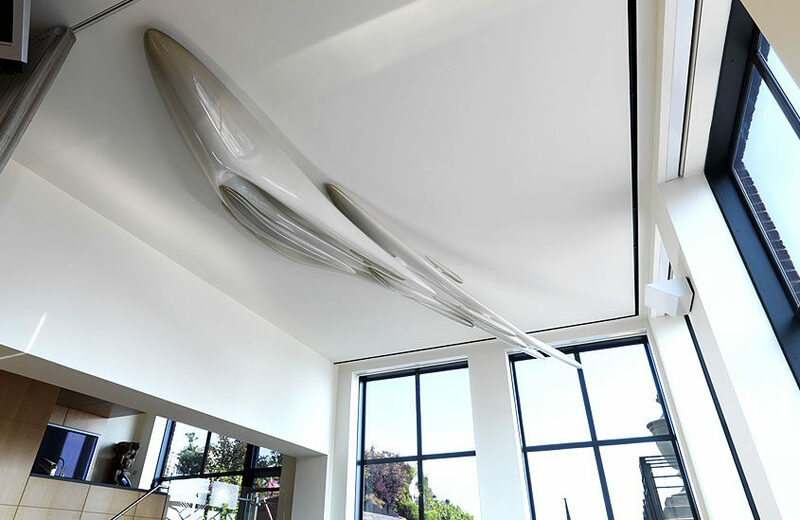 Working closely with Zaha’s talented architects, CCTI utilized the provided 3D models of the sculptures to begin the fabrication process. Creating the two mega-works involved CNC cutting numerous intricate shapes per stalactite all of which were then meticulously joined in the composite phase. Steel rods were run down the middle of each piece to allow hanging. The pieces then received their signature, high-gloss finish courtesy of Ichiban Yacht Painters in Bristol, Rhode Island. Figuring out how to install “Stalactites” was the next challenge. “We came up with three mounting scenarios just to cover all the bases, because there was no time to spare,” says Hassett. In the end they used elements of all three. “There was nothing but sheetrock hanging from the ceiling of the gallery, so we had to create a structurally sound mount that could support the eighteen individual stalactites. It was like putting a giant jigsaw puzzle together upside down, working with pieces that weighed hundreds of pounds.” In the end, bolts were integrated in the tops of the stalactites and the larger ones were actually screwed into the ceiling. The final outcome was success with the sculptures fabricated flawlessly and on time. At the end of the exhibit, the CCTI crew returned to the Sonnabend Art Gallery in Manhattan to disassemble all of the sculptures, return the gallery to its original presentation, and transport the sculptures back to the Bath, Maine, facility at CCTI. Custom, transportable packaging of each sculpture was prepared with special foam inserts to protect each individual sculpture from harm.